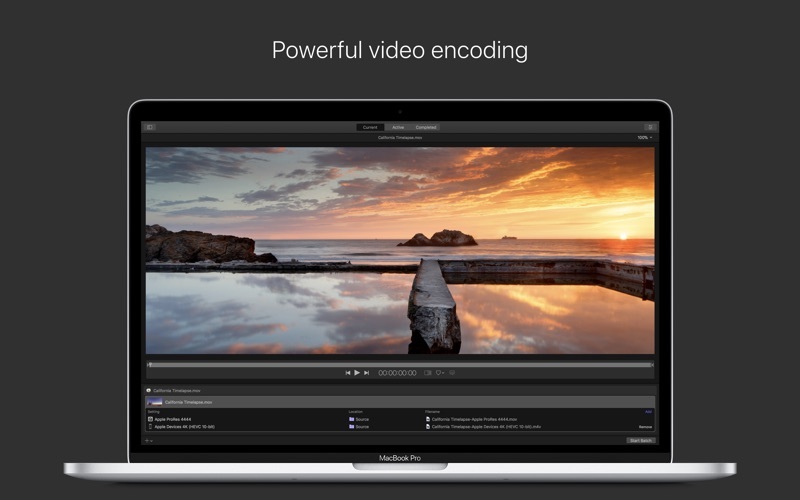 Compressor integrates tightly with Final Cut Pro to add power and flexibility to your video conversions. 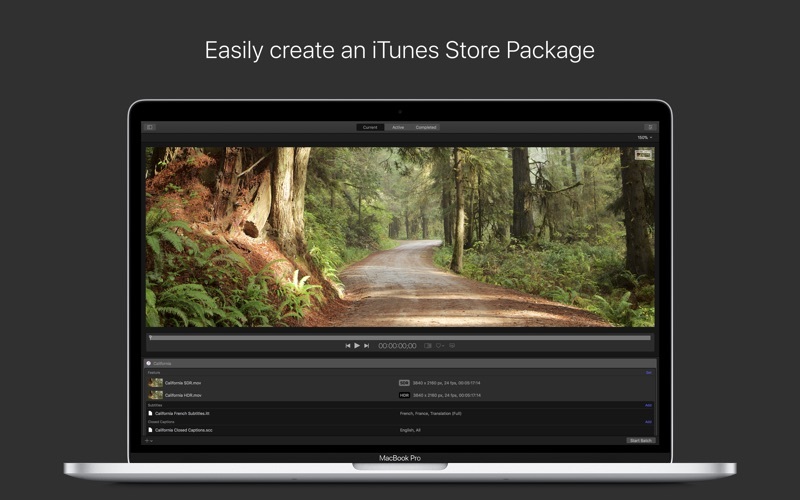 A simple interface lets you quickly customize output settings, enhance images, and package your film for sale on the iTunes Store. For even faster conversions, easily set up distributed encoding using other Mac computers. Advanced Encoding for Final Cut Pro • Use Compressor to customize encoding settings and the setting will automatically appear in Final Cut Pro • Set up batch processes to streamline the encoding of large numbers of files • Build custom Destinations to combine encoding with additional tasks such as moving or copying files • Create self-contained Droplets to encode on the desktop with drag-and-drop ease • Share settings like an HEVC output setting with other editors, even if Compressor isn't installed on their systems • Send Final Cut Pro and Motion projects to Compressor to encode video in the HEVC format iTunes Store Package Creation • Import and organize your movie, trailer, closed captions, audio descriptions, and subtitles into an iTunes Store-compliant package for submission to an Apple-certified iTunes delivery partner • Audition video with any audio, caption, or subtitle to verify sync • Built-in error detection helps you identify issues with your iTunes Store Package and navigate directly to the source of the issue • Deliver HDR video as P3 D65 PQ, Rec. 2020 HLG, and Rec. 2020 PQ for HDR10 • Support in the iTunes Store Package to link a Dolby Vision graded video file to a Dolby Vision XML Support for Industry Standards • Encode to a broad range of industry standard formats including HEVC, MPEG-4, H.264, MXF and ProRes • Work with a choice of themed menus to encode and burn a DVD or Blu-ray disc • Generate files for HTTP live streaming in a single step • Import Targa, DPX, TIFF, PSD, PNG or OpenEXR image sequences and encode them to any setting • View, adjust, and deliver closed captions in CEA-608, SRT, and iTT formats Pristine Format Conversions • Convert any file between formats — such as NTSC to PAL, SD to HD or progressive to interlaced video • Import and manipulate wide color video, then deliver in standard Rec. 601 and Rec. 709 color spaces or in wide Rec. 2020 color space • Deliver High Dynamic Range (HDR) video with controls for color space conversions and HDR metadata • Deliver HDR video as P3 D65 PQ, Rec. 2020 PQ, and Rec. 2020 HLG • Use CABAC entropy multi-pass H.264 encoding for superior results with hardware-accelerated export on supported systems • Clean up and customize your content using image filters, a timecode overlay, and watermarks • Speed up video, slow it down, or adjust the frame rate to make the duration match a runtime Distributed Encoding • Save time by distributing encoding work among multiple workstations • Install Compressor on any Mac to activate it as a node for distributed encoding • Speed up encoding in Final Cut Pro by choosing a group of shared computers for exporting System Requirements: macOS 10.13.6 or later, 4GB of RAM (8GB recommended for 4K editing, 3D titles, and 360° video editing), OpenCL-capable GPU graphics card or Intel HD Graphics 3000 or later, 256MB of VRAM (1GB recommended for 4K editing, 3D titles, and 360° video editing), 1.2GB of available disk space. 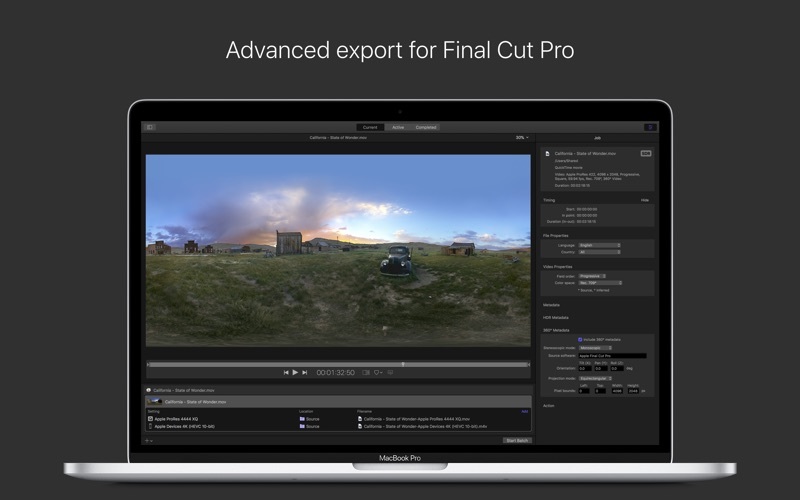 ProRes RAW requires a Mac computer that supports Metal. Some features require Internet access; fees may apply. Blu-ray recorder required for burning Blu-ray discs. HEVC export requires macOS High Sierra. It encodes my video. It is awesome. Terrible! It crashes when compressing H.264 to HEVC. Simply unuseful. The main purpose I bought it was to compress H.264 and HEVC (H.265) videos, but this software can't deal with it. I want my money back!!! Compressor: 4.3.2 Overall this is a nice compressing app, the interface is user friendly and simple to use, I wish more apps were this clean and focused on just doing what they are suppose to do. The batch rendering feature in this app is a god send. I have one issue with Compressor, and it is kinda a big one for me. It is horrible at h.264 compression, which is weird having an Apple product that cant do h.264 well. If you Compress using the more lossless formats like 4:2:2 or 4:4:4:4 the app has great results and fast render times, but h.264 is slow and horrible quality compared to Adobe products ore even the freeware HandBrake. So I use this app to render my videos in apple ProRes 4:2:2 and then I use “HandBrake” to get them to a smaller file size and the h.264 format with out quality loss. There is no reason Adobe and freeware products should kick the pants off of Apple when it comes to Compressing video to h.264 format but they do and Apple should fix this. i’m removing 2 stars from this product rating because an app that is solely designed to compress video files should be amazing at just that, and this one fall short when dealing with the h.264 codex. 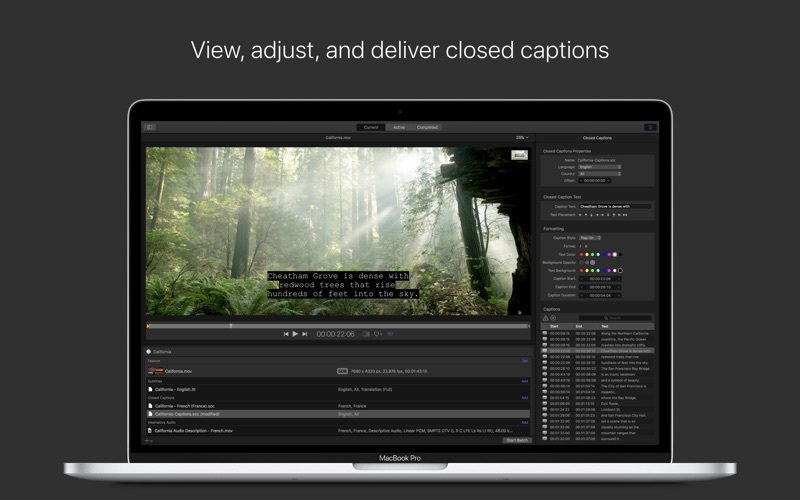 In the help section of Apple's video/movie producing software Final Cut, Compressor is advertised as "DVD Authoring" software. However, Compressor is mainly a stand-alone media conversion software, converting audio or video files into different formats. This includes a Create DVD option with the output as either a DVD Image or to a connected DVD burner, but it does not have the ability to produced stylish menus for DVD's. Compressor is quite versatile, but the App "iMedia Converter Deluxe" will perform almost as well, has a better user-friendly interface, and can produce stylish menus for DVDs. If you want the ability to have maximum flexibility in converting media and don't have either Final Cut or iMedia Converter Deluxe, Compressor is a good choice. I updated FCP and worked on a project and now trying to send it to Compressor. FCP says I need the newest Compressor but when I go to the App store it does not show an update. If I got to Compressor in the App store it will not let me install it because it says it is installed. So, I am caught in the old infinite “Do Loop”. Any ideas on how soon Apple will fix this? Can’t rate it yet but gave it a 2 because I can’t get it to install. It appears that Compressor, even when "Prefer eGPU is selected", will only utilize your Mac's on-board GPU and totally ignores an eGPU for rendering. I really wish Compessor can be updated to support eGPU. Compressor 4.4.1 crashes early in launch as soon as the splash screen appears on 10.14.0. What a joke.